Largely arid or semi-arid in terms of its climate and geography, South Australia nevertheless boasts several picturesque mountain ranges and grasslands, particularly in its coastal region. Founded in 1836 as a planned colonial province rather than a penal settlement, South Australia has a slightly different modern history than Australia's other states. Economically prosperous and culturally rich, South Australia boasts a confident, easygoing personality. Adelaide: The main port of entry for most South Australia holidays, leafy Adelaide welcomes visitors with a laidback vibe, typically sunny weather, and a host of impressive churches to complement its long expanses of beach. McLaren Vale: Known for producing a range of excellent wines--especially full-flavored reds--this coastal town just south of the state capital also offers scenic nature and pleasant beaches. Tanunda: Home to some of the state's most famous vineyards, this town serves as an excellent base for exploring the wineries of the area. Mount Gambier: Nestled in the southeastern corner of the state, this lush town stands out as one of the highlights of South Australia tourism, its network of caves and sinkholes attracting visitors from around the world. Glenelg Tram: There's no better way to tour the beachfront suburb--and other suburbs of Adelaide--than by grabbing a ticket and hopping on this tram, the city's last remaining of its kind. Adelaide Zoo: An undisputed highlight of South Australia tourism, this expansive zoo sits in the city's park district and houses more than 1,800 animals, both from Australia and abroad. 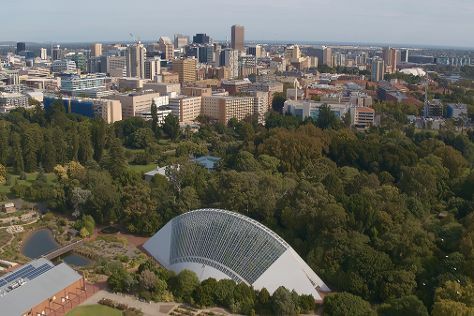 Adelaide Botanic Garden: A soothing oasis of green in the middle of the city, this comprehensive garden displays all manner of flowers and plants in a range of themed zones, including a simulated wetland, several greenhouses, and a rose garden. Adelaide Central Market: Featuring an abundance of food stalls and small restaurants, this aromatic fresh-produce market is the unmissable South Australia attraction for food lovers. Cleland Wildlife Park: Located on the fringe of the city, but still only a 20-minute drive from its center, this conservation park cares for a range of native Australian animals, including kangaroos, emus, wallabies, and wombats. Seal Bay Conservation Park: This nature reserve on Kangaroo Island provides an important habitat for seals and sea lions, offering you an opportunity to get up close and personal with the majestic creatures in the wild. Rundle Mall: Avid shoppers should add this central mall to their South Australia itinerary for the chance to find all manner of big-name brands under one roof, right in the heart of the city. Flinders Chase National Park: Known as one of the most picturesque corners of Kangaroo Island, this national park houses one of the country's largest fur seal colonies, and also offers some particularly photogenic rock formations. The Blue Lake: This iconic crater lake adds a touch of magic to any South Australia vacation, its sapphire-blue water forming a striking contrast against the lush green surroundings. Granite Island: Named after the massive granite boulders that dot its beaches, this recreational park attracts visitors who come to watch families of miniature penguins waddling ashore every evening at dusk. With the state's laidback attitude and wealth of nature-inspired tourist options, most destinations in South Australia offer plenty to keep the kids entertained. You'll find the best range of options in the biggest city, Adelaide, where they can have a ball roaming through zoos and theme parks, then take a dip at the beach on the same day. Make Mount Gambier the next stop on your South Australia itinerary--here, the kids can delve underground and explore a famous network of caves. If you can brave the heat, head to the opal-mining town of Coober Pedy, where the kids can enjoy the surreal experience of staying in an underground hotel. The kids will have no shortage of things to do in South Australia, with most of the state's major destinations well-equipped to cater to children. Take a family excursion to Adelaide Zoo, or a little farther out to Cleland Wildlife Park--either way, the kids can come face-to-face with some of the most iconic species of Australian animals. If they're feeling a bit less energetic, catch a movie at Rundle Mall. For the chance to admire penguins in the wild during your trip to South Australia, head to Granite Island and enjoy the little creatures' show at dusk. Like in many regions in Australia, the easiest way to get from place to place on a family holiday in South Australia is to rent a car. This can save money and time, and allow you the flexibility to stop at the state's many natural attractions on your way. As your kids will be spending a lot of time outdoors during your South Australia holiday, remember to pack plenty of sun-protective clothing, and bring enough sunscreen and insect repellent to last the journey. If you head out on a nature walk with the whole family, remember to keep an eye on the kids and make sure they don't stray into long grass, where snakes typically thrive. The importance of agriculture to the state's economy means you'll get to taste a wealth of delicious food made using fresh, local ingredients during your South Australia vacation. Along the state's extensive coastline, in places like McLaren Vale and Port Lincoln, you can try some exceptional, freshly caught seafood, like bluefin tuna, whiting, and crab. If your South Australia itinerary takes you to Tanunda or the surrounding Barossa Valley, make sure you try the local bratwurst sausage--a dish that reflects the region's strong German heritage--accompanied by some locally produced cheese. Perhaps South Australia's strangest specialty is the pie floater, a meat pie served in a bowl of pea soup. Most major shopping centers cluster in and around Adelaide, where you can visit large complexes like Rundle Mall to get all of your brand-name needs under one roof. If you have a hankering for fresh produce and want to shop somewhere with a bit of extra atmosphere, head to Adelaide Central Market and enjoy the sights, smells, and tastes. If your South Australia itinerary takes you to the wine regions around Tanunda or McLaren Vale, make sure you buy a few bottles of local wine to take home. South Australia is known as "The Festival State," and with good reason. If you plan your South Australia vacation during February and March, you can catch the state's most famous festival, Adelaide Fringe Festival. Coinciding with smaller festivals like WOMADelaide and Adelaide Festival of Arts, this celebration brings the city to life with a host of live music, arts, and dramatic performances. Visit South Australia around Christmas and you can catch Carols by Candlelight--a family-friendly sing-along at Tanunda. Famously known as a dry state, South Australia consists mostly of arid, desert-like inland regions that experience very little rainfall and can get extremely hot, especially between December and February. Since most tourist destinations in South Australia sit along or near the coast, you're likely to experience much more pleasant weather during your South Australia vacation. From Mount Gambier up to Adelaide and beyond, a Mediterranean climate prevails, with warm to hot summers, and cool winters between June and August. The state also enjoys an average of 2,500 sunlight hours per year, making it one of the sunniest parts of Australia. Large swathes of land and an extremely low population density can present some transportation difficulties during a tour of South Australia. Adelaide offers convenient public transportation, with a metropolitan rail and bus network connecting the suburbs with the city center. Intercity rail travel is much less common, with a few tourist railways providing services to popular South Australia destinations, while bus lines service most major towns. Air travel presents a much quicker and potentially less expensive way to travel, although many tourists choose to rent a car or van and tour South Australia independently.